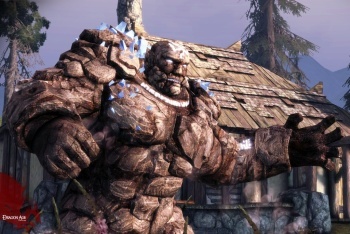 GameStop has been sued over its "deceptively misleading" pre-owned game sales after a customer bought a used copy of Dragon Age: Origins and then discovered he'd have to pay extra to get the downloadable content advertised on the box. In January, James Collins purchased a pre-owned copy of BioWare's hit RPG Dragon Age: Origins from a GameStop in Hayward, California, paying $54.99 rather than the $59.99 cost of a new copy. "Weeks later," however, he discovered that the DLC advertised on the package would actually cost him another $15, putting the price of his used game $10 higher than the cost of a new one. When he attempted to return the game, he was told that he'd gone beyond the store's seven-day return policy and was therefore out of luck. But rather than just learning his lesson and getting on with life, Collins did what everyone does these days: He sued. "GameStop fraudulently, unfairly, unlawfully, and deceptively misleads consumers at the time of their purchase to believe that the game comes with free downloadable content, when in fact, it does not," Collins claimed in his lawsuit. "Despite the representation on the packaging that the game comes with a free use code, unbeknownst to consumers who purchase a used copy of one of these games, upon attempting to download the content identified on the game's packaging, consumers are unable to do so unless they pay an additional fee. This occurs because the use codes have already been used by the individual who purchased the game as new." "GameStop, who makes more than 20% of its revenue and nearly $2 billion from the sale of used video games, is aware of this issue, and continues to fail to alert customers that this content is not available on used games," it adds. I checked out my own copy of Dragon Age: Origins and it does specify, on the back, that it includes Shale, The Stone Prisoner and Blood Dragon Armor as DLC, but each is marked with an asterisk; reading further, the asterisk is revealed to mean, "One time use code available with full retail purchase. Expires April 30, 2010." It seems clear enough, but then again, who's got time to read and comprehend when there's five bucks on the line? It's an interesting and, I would imagine, entirely unforeseen consequence of EA's "Project Ten Dollar," the company's creative, hopefully successful attempt at combating used game sales by offering bonus content to people who buy new. But who is actually responsible for making consumers aware of the program and others like it: GameStop or the publishers who provide and, ultimately, limit the content?